10 tips and tricks to keep you from over indulging this Christmas! Christmas is such a tasty time of year. There is always lots of good food and of course granny’s baking. However sometimes we may over indulge and end up steering our health in the wrong direction. Check out these 10 tips from Dr. DJ on how to survive over doing it but still enjoying all the goodness that the holiday season brings. Distance helps the heart stay healthy. At a party, don’t stand next to the food table. That makes it harder to mindlessly reach for food as you talk. If you know you are prone to recreational eating, pop a mint or a stick of gum so you won’t keep reaching for the chips. Don’t go out with an empty tank. Before setting out for a party, eat something so you don’t arrive famished. Excellent pre-party snacks combine complex carbohydrates with protein and unsaturated fat. Watch your drinks. Drink calories add up quick. If you choose to drink alcohol, alternate between lower calorie options like sparkling water with lime. Love eggnog? Enjoy a small cup and think of it as dessert. Avoid alcohol on an empty stomach. Alcohol increases your appetite and diminishes your ability to control what you eat. Load up on colour. Ketchup doesn’t count! Fill half your plate with veggies and fruit. They make great snacks and even better side or main dishes. Be buffet savvy. At a buffet, wander around the food table before putting anything on your plate. By checking out all of your options, you might be less inclined to pile on items one after another. Take 10 before taking seconds. It takes a few minutes for your stomach’s “I’m getting full” signal to reach your brain. After finishing your first helping, take a 10-minute break. Make conversation. Drink some water. Then recheck your appetite. You might realize you are full, or want only a small portion of seconds. Enjoy your favourite holiday foods. 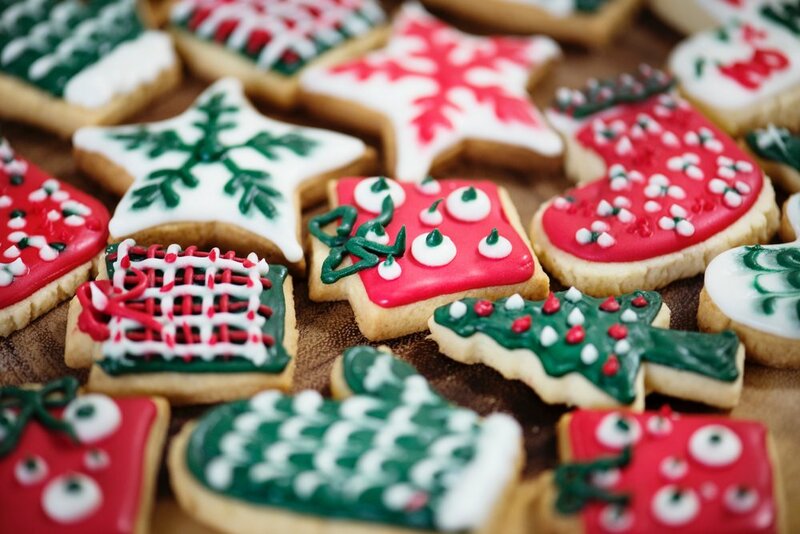 Enjoy special holiday foods like shortbread cookies, turkey with stuffing, and mashed potatoes, but keep your portions controlled by using smaller plates. Pass on high-calorie foods that you can get anytime, like chips and chocolate. Be active. Adults should aim for 2 ½ hours of weekly physical activity. Even 10 minute bursts count! Set specific goals. Instead of just “eating healthier”, try eating one serving of vegetables or fruit with every meal. An easy way to track your progress is to write down what you’re eating! Lastly, have fun! Don’t beat yourself up on the small stuff, and celebrate your successes.